We have agreed to do a trapout. 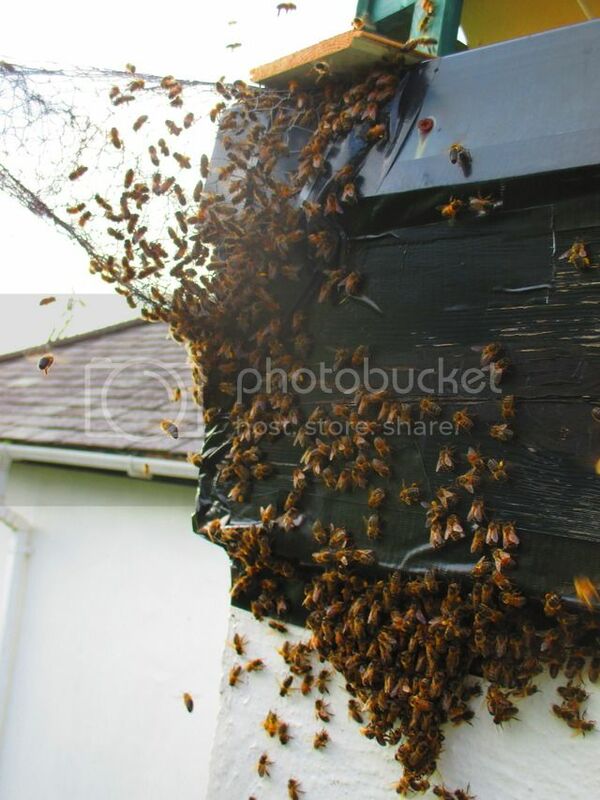 The bees exit from a corner of a nice flat roof one storey high, so no problem locating the TBH bait hive close. I have been reading and watching on You Tube how to do it. The weather is still down to 4 or 5C at night so I have not wanted to open my hives yet, and I have not yet seen drones flying, so it is still a little early to do it as you need the new queen to be mated. So I have time to plan. I shall need to obtain a comb of eggs from one of my TBHs to put in the hive at the trapout. I have to transport it across the country and it could take 2hrs or more from removal of comb to being in the hive at the trapout with the cone in operation. Do you take some bees with the eggs? or do you remove all the bees. Do you have to keep them warm for the journey? Another question is - I don't want to deplete a growing colony of a large comb of eggs and brood - can I take a piece of comb and attach it to a top bar - how big/small a piece would work? I would also recommend using a national rather than a top bar, just because the frames give the comb more stability for transport, especially when you are talking about leaving it in situ for 6 weeks or so.... by then it will be full of honey and brood.... trap outs lay down honey quite quickly because initially they have lots of foragers and very little brood to look after. I made a lightweight 6 frame nuc out of plastic bathroom panelling screwed to a wooden frame.... it was really easy to cut with a craft blade and cost me nothing as I got it out of a skip. You could then cut out a piece of brood comb and fasten it into a shallow honey frame if you don't want to sacrifice a whole comb. I leave nurse bees on the comb to look after it and I haven't had a problem with them accepting foragers from the trap out colony....no different really to swapping a weak hive with a strong one to give it a boost. The trap out bees are all foragers laden with pollen/nectar, so they will be welcomed in the bait hive. There was about 20lbs of honey in my first nuc after a few weeks because there was a flow on and I would say that the best time to do it is during a good flow. My opinion is that this is a job best left until late spring/early summer and that you need to enlist the help of someone much more local than 2 hrs away (I found 10-15 mins was the sort of distance that made the job feasible, so that I could have a drive past every day for the first few days and tweek things as necessary and then weekly after that. I would recommend frames/national nuc. for stability but don't leave a good one as these things can get stolen... which is another reason why my DIY one was preferable as it cost be nothing other than time and was less attractive to a thief. 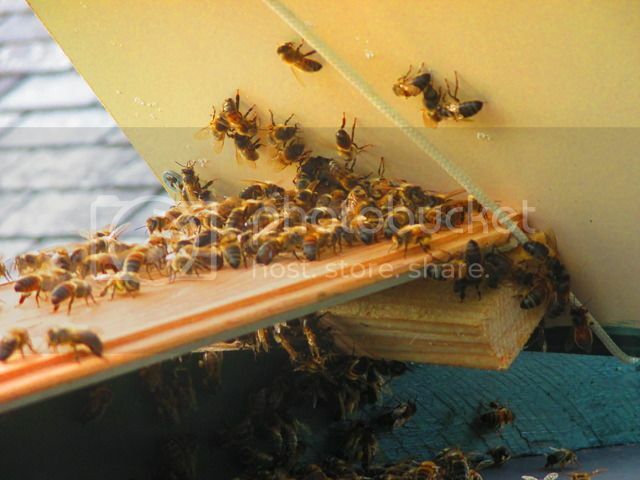 It's important to make some sort of ladder from the base of the cone where all the bees will congregate to the entrance to the bait hive/nuc, so that whilst they are milling around trying to find a way in, they can easily walk up to the entrance. Handy things to have with you are scraps of wood and cardboard and mastic to plug any gaps they find and I found clove oil worked a treat in preventing them from running along places I didn't want them trying to find a way in. Painting or daubing it on the brickwork in the directions you don't want them to travel... maybe a foot from the entrance, stopped them tracking along and around corners and could be used like an invisible force field to channel them in the direction you want by blocking all other directions. Difficult to explain but worked a treat for me where the bees were running along behind the facia looking for a new way in and were on the point of turning a corner and going onto a wall that I couldn't access with a ladder. Hope that has given you some food for thought. I'm really not trying to put you off but just give you plenty of knowledge to tackle the job as these things are not always as straightforward as they appear and I would hate for you to spend a lot of time and effort and end up with a disaster as my second one turned into (because they literally starved and died in the cone or fell out of the end too weak to fly). Both of my initial instalments were on old walls with crumbling pointing, where they tracked as far as 6 feet to find a new way in. Of course they waited until after I had gone even though I spent several hours setting them up in the first place and observing them. It takes quite a while for them to give up trying and go for the bait hive and even then, when you think you have cracked it and head off, the next day, the saga starts again with new foragers emerging. Good luck with it and I hope you find someone local who is prepared to help out. They don't have to be experienced beekeepers, just be able to check on it and make minor modifications, like blocking holes and maybe daubing on a bit of clove oil. If you have any questions you think I may be able to answer give me a shout and if you have photos of the site, it might help to post them so that I can possibly give suggestions based on my experience. Wish I lived nearer to give you a hand. What a great and helpful reply Barbara! As usual! The lady in the house will keep an eye on them and let us know any problems, and she could probably block holes. We only live 30mins away and often go in that direction anyway. - It is just 2 hrs collecting egg comb from one apiary and taking it there. Actually they are only about an hour apart, but got to account for all the business of doing the job. That is why I was worried about them getting cold, but the bees on them will keep them warm. If we are waiting for a flow, there is time to plan it. your list of items is very helpful, especially a ladder to the entrance. I shall think seriously about using a National. The info on clove oil is a good idea. Will let you know how we get on. Always rely on Barbara for giving the best information. I admire Barbara for all her knowledge and for being soo helpful. Kind of you to say so. I was worried that I was going to come across as a damp squib on this one, as I seemed to be outlining all the negatives of the situation, but having dealt with trap outs myself and had one success and one disaster, it's good to ne able to hopefully increase someone else's chance of success by learning from my failure or the difficulties I experienced and how I got round them. The bees mill around at the base of the comb when they come back and can't get in. They walk back and forth looking for a way in and don't seem to fly much in their confusion to find the entrance, so it's important for them to be able to walk up to the entrance to the bait hive from the cone relatively easily. The clove oil happened to be in my beekeeping box and was a last desperate attempt to stop them finding a way back in that I couldn't reach to block. I just tipped some onto my fingers and ran my fingers down the brick work and it stopped them in their tracks and turned them back in the direction of the bait hive like an invisible shield. It might be worth leaving the home owner a hat and veil that she can use if she needs to do any minor adjustments but you probably already thought of that. Look forward to reading reports of your progress when the time comes. I should also say that a lot of my knowledge has come from reading threads on this forum, kindly offered up by other members, so I am only giving back what I have benefitted from myself. Thanks go to Phil for having the foresight to provide a place like this for us all to exchange our knowledge and learn. As an example of this, I opened a struggling hive to top up a feeder the other day and the crown board was crawling with ants. I've never had a problem with ants in my hives before even though there are many nests in the vicinity but this colony is so small it clearly posed a serious risk. I had a moment of panic and then I remembered a post I had read a couple of years ago about someone in the USA using cinnamon, so I dashed in the house and raided my spice rack and gave the crown board and ants a liberal dusting of ground cinnamon (the bees don't have access to this area at the moment) and a couple of days later, the ants were all gone. Result!.... And many thanks to whoever it was across the pond who kindly posted that tip! Today I inspected one of my hives, hoping to find some eggs. After my sadnesses with other hives - this had 10 full combs of brood with stores bursting on top!! I only looked at each end. Beautiful sealed brood plus lovely white grubs. Comb number one was full of drone brood, so I looked on the second comb full of sealed worker brood, with a tiny patch of eggs at the bottom. I broke off this patch and fastened it with the wire hanger onto a top bar. A second bar had a small piece of honey comb on. I set this bait hive with 5 bars altogether using the follower board. 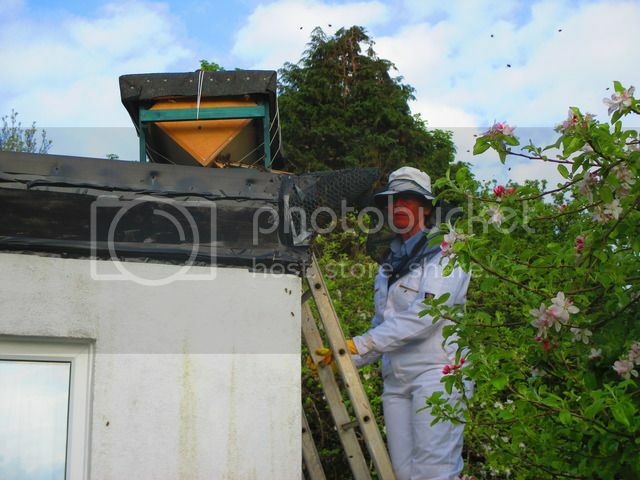 We drove to the trapout site and set the hive on the roof and unsealed the entrance. I had made the cone from chicken netting lined with fabric mesh sewn in. As it had to fit around a corner, it need to be mouldable. I had "hemmed" the edges with gaffa tape. 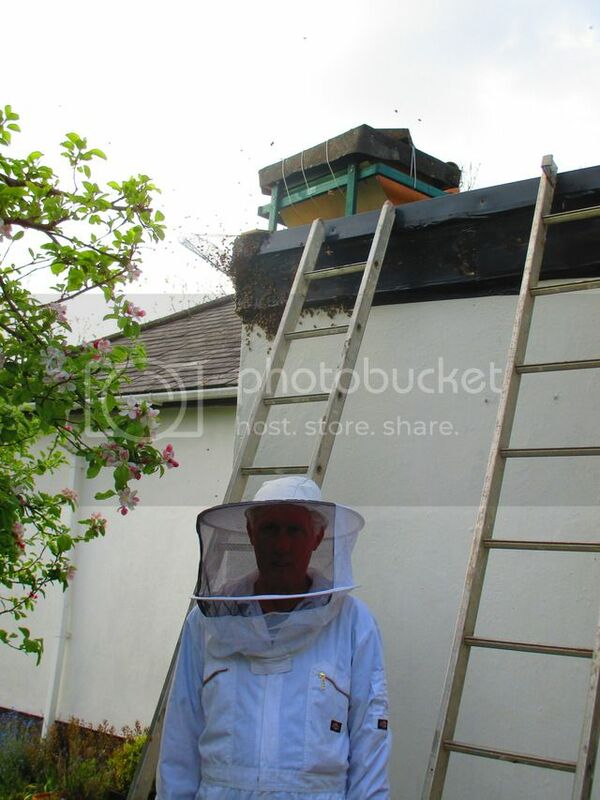 We gaffa taped it into position and screwed a wooden bridge from the cone to the hive entrance. Immediately bees walked up it into the entrance! After half hour (cup of tea) there were bees fanning on the bridge and crowding to get in. That was a surprise! We had to restick some bits of gaffa tape on the roof and applied the clove oil. I couldn't see bees getting back in so far, and indeed some were just festooned from the soffit board, quite still and calm. All much calmer than when we first put the cone in place. The poor lady of the house has flu - so won't be much help keeping an eye on them at the moment I don't expect! We will perhaps go back tomorrow? Great to hear that you had a hive with plenty of brood to spare and even better that the trap out bees found the bait hive so quickly and were obliging. Hope it continues to proceed so smoothly over the coming weeks. I've never done a trap out because of the difficulties already highlighted & because my interest in obtaining new colonies is increasing the genetic diversity of my stocks. Even if you clear the whole colony the one bee I'm interested in will be left behind to die or hopefully she will leave in a hunger swarm when stores run low. But congratulations on how well it's going so far. & thanks for sharing your excellent photos that demonstrate this procedure really well. Yes I would love to get the queen - obviously a thriving prolific colony! - so we have left a bait hive in the garden as well. I have read about queens coming out and going in the hive with the others too. We shall see. On day 3 I looked inside the hive and bees were beyond the follower (5bars) so I moved it to give them 8 bars. A nice cluster on the first 4 bars. No bees seemed to be getting back in to the roof, but I renewed the clove oil and applied a bit more gaffa tape. Today (day 12) we just looked from the outside. A couple of bees left the cone as I watched and a couple were trying to get back in. I put some more clove oil at that spot and they stopped. The hive is very busy with foragers going straight out and back, some with pollen. Thoughts - you cannot guarantee that the eggs I provided them with were fertilised and not drone. If they don't raise a queen presumably some workers would become drone layers? At day 15 I would expect the new queen if there is one, to emerge. Should I look inside the hive at some stage and when? Is any there any purpose to checking, as there is not much I can do about anything! What are your thoughts? PS We called on a beginner who reported bees at her bait hive. We found the nearby swarm and saw that that was the direction of the scout bees. 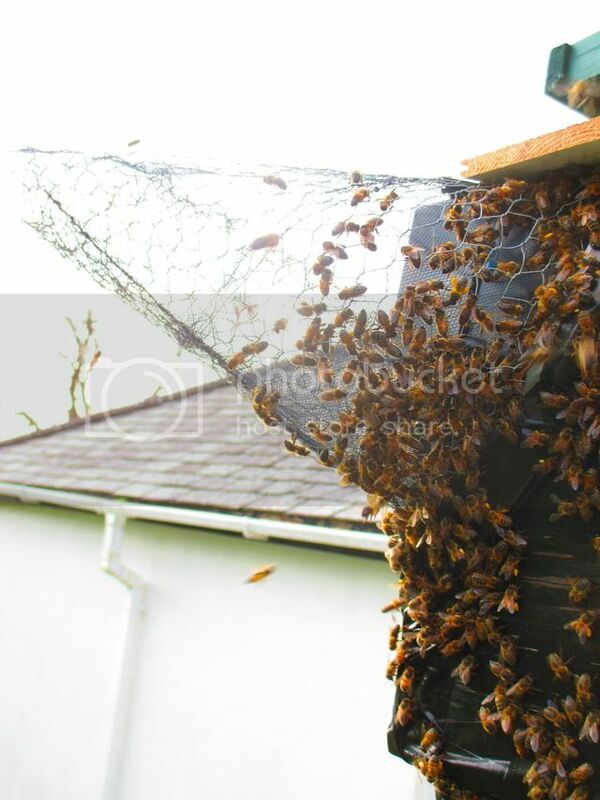 There was probably 100 bees at the bait hive, so I advised a deckchair, camera and cup of tea - she saw the swarm move in! How delightful is that! WOW! That's brilliant. So pleased that your beginner acquaintance was so fortunate as to attract a swarm and actually witness it move in. Doesn't get better than that. As regards your trap out. I check and empty the bait hive as required because it gets chock full of honey otherwise (lots of foragers and no brood to feed = lots of honey produced).... you might have difficulty lifting it down if you haven't emptied it yet. Ideally you want to empty it of honey before any emergency queen cells hatch. I use a National nuc for trap outs for ease of transportation as there is no risk of comb collapse. Leave the brood frame and replace most of the honey bars with empty bars for them to draw more comb and either harvest the honey if it is capped or give it to another hive to finish! You don't want to end up with a box on a roof with 30-40lbs of honey in it that you then have to try to lift down....a nice problem to have, but a problem nevertheless! Good luck with them. It sounds like it is all going extremely well so far. If the eggs where in worker cells & from a queenright colony there's little risk of that. More risk they might have become chilled or shaken during transport but if pollen is going in all seems good. Good news on your beginners swarm. I looked inside the hive - They have built on the 8 bars so I added 3 more. Examined each comb - sealed honey and pollen on every one. I could not see any eggs or the queen, and yet the bees who had been isolated in the empty end of the hive were rushing back to the colony and there were bees fanning too. They were very calm during the inspection and looked very busy and organised. A couple of bees buzzed us indicating they had something to protect. We took photos and on the first comb of the hive I am sure I can see a few eggs and possibly the queen. It looks as though she has just started to come in to lay. There were loads of bees in there. There were no bees at all coming out of the cone. How long should we leave all this in place do you think? Last night 5.30pm, looked at the hive, busy, but no pollen, so looked today at about 10.30am - still no pollen! It looks as though there is no laying queen. Bother! I don't want to look inside the hive again and loosen the honey combs before transporting the hive. I just presume she is not laying, do you agree? We will have to check which of my swarms are queen right and combine one of them with this trapout. Bit disappointing that there is no obvious pollen going in. Weather has been pretty dreadful here in the last couple of weeks for mating flights so perhaps she has been delayed. I can't see anywhere on this thread where it says you have inspected the hive and found a queen cell or two.... am I overlooking that or have you not inspected at all apart from moving the follower board back? The other thing I notice from reading back through your account is that you cut the piece of brood comb with eggs on it off a top bar and reattached it. I would have put the whole comb with attached bees into the bait hive. It may be that the eggs had started development but then got chilled in transit with no attendants and became unviable before you got the trap out set up. On the other hand, there could be a virgin queen in there but mating flights have been delayed for better weather conditions. Be prepared for that hive to be incredibly heavy, because it should be full of honey and perhaps there is even no room available for brood. When I have done trap outs, I have part emptied the hive after a couple of weeks and checked for queen cells and given more brood if necessary. I think it is probably easier to do that with a framed nuc as the honey combs can be removed and transported without fear of collapse. Are you intending to continue with it or is there no more traffic from the cone? If you are particularly wanting to keep them as an independent colony and there isn't a queen, you could always donate another comb of brood back at home and let them try to raise a queen again. I don't think it is too late and they should already have enough stores to get through winter, so they will just need to rear brood. Keep us posted with what happens next. PS. I have one to start on Thurs. First storey flat roof, so we have a scaffolding tower but will still need step ladder on top. Not overly keen on working at heights but will no doubt manage. Hopefully the weather is going to be improve just in time to start it. We brought the hive home yesterday and sealed the hole in the flat roof with gaffa tape. This inspection is 23 days from the previous one. Bees on 8 bars. A lot of the honey is gone but there is still plenty of sealed honey nectar and pollen! The second and third bars in from the honey end have sealed worker brood plus some sealed drone scattered plus some supecedure cells? I couldn't see any eggs or grubs but was not able to look at more of the combs as they are curved and cover more than one bar. So they have had a laying queen but not now and raising a new one? There are loads of bees and very busy and seem organised. Good to hear that they raised a queen after all. My guess would be that those are swarm cells and not supercedure cells..... you have a lot of bees in a hive that was quite full of honey..... that would usually trigger swarm prep..... and now, even though quite a bit of the honey has been used, it may be too late for them to change plans. Worth keeping a close eye on them.